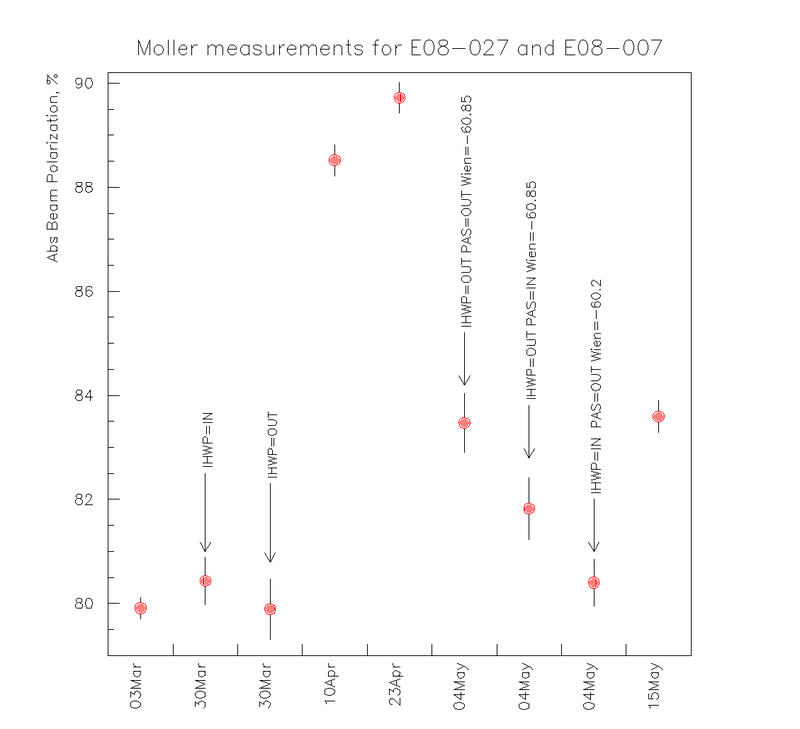 The summary is given of the Møller measurements done for E08-027 G2P and E08-007 experiments. Both experiments were running in the Hall A on period February 16 - May 17, 2012. The details of the measurements can be found here . Systematic error. 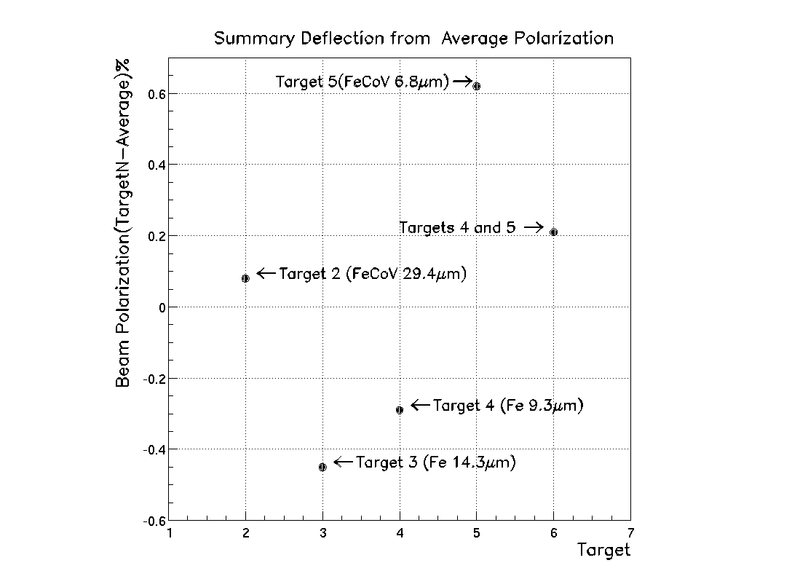 Low field (tilted) polarized electron target was used for the beam polarization measurements at the period of E08-007\E08-027 experiments running. The target has four foils made of different materials (pure Iron and Supermendur alloy) and with different thicknesses. Usually averaged result of the beam polarization measurement with all four foils is used. Due to a different foils thickness the beam current 0.2-0.5μA is required for the beam polarization measurements with all four foils. E08-007\E08-027 experiments were done at low beam current ~0.1μA. Due to that only one foil (foil #2 Supermendur alloy 29.4μm) was used to reduce time of the beam polarization measurements. The plot.ps or the plot.png is a summary of a five years of the low field polarized electron target running. 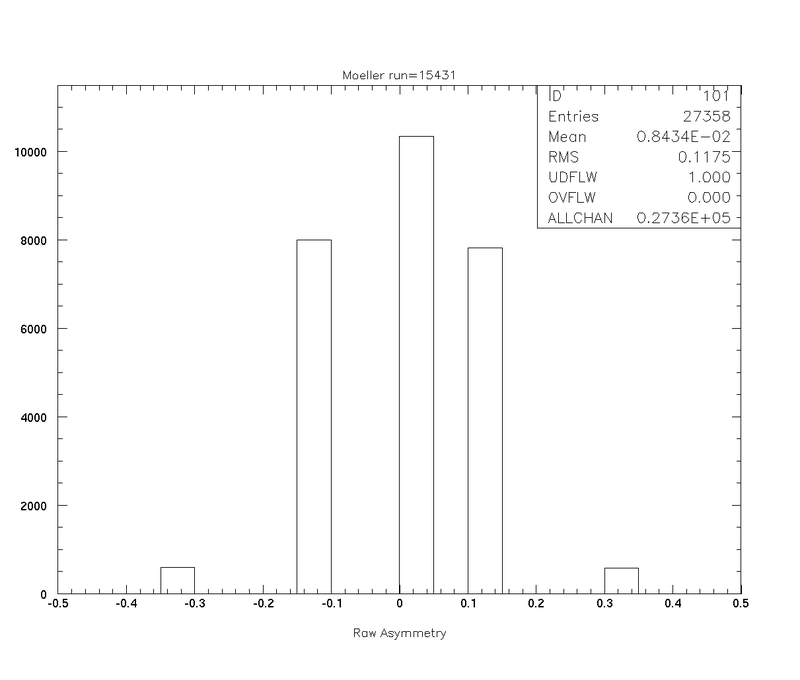 As it is seen from the plot a difference between the results of the beam polarization measurements with averaging of all four foils and with only foil #2 is <0.1%. Thus, systematic error of the beam polarization measurements with the foil #2 for the period of E08-007\E08-027 experiments running was 1.7% - the same as for the measurements with all four foils. Two beam charge asymmetry tests (January 31 and March 03) were done at the period of the experiments running to prove a correct sign of the measured beam polarization. At the experiments running period Hall C was running with very high beam current ~100μA. The beam bleed-through measurements were done for all beam polarization measurements except the first one (March 3). The results of the beam bleed-through measurement are summarized in the table bellow. Large statistical errors of the bleed-through measurements is a result of combination of very low bleed-through current and 1kHz helicity frequency. As the result of this combination rate per helicity cycle was ~1.3 electrons. Thus, the beam asymmetry/polarization distribution was extremely wide (see on the plot.png the beam asymmetry distribution for one of the bleed-through measurement runs). As it is seen from the picture the beam asymmetry value is more than order smaller than RMS/error. A few hours of the bleed-through measurements could help to reduce the statistical error. The beam current for the experiments running and the beam polarization measurements was the same. The beam energy at the periods of the beam polarization measurements was stable. Thus no correction on the beam fluctuation was needed.